KAMUT® (kah-MOOT) is the manufacturer and brand name of a Khorasan wheat that is available in the US. Khorasan is an ancient wheat, the grain of which is two times larger than modern wheat. It has a rich, nutty flavor. As produced by Kamut, it’s organic and whole grain—just as it was in the time of the Pharaohs. And it’s better for you than modern wheat: higher in protein and many minerals, especially magnesium, selenium and zinc. It has a higher percentage of lipids, which produce more energy in the body than wheat’s carbohydrates. Think of it as high energy wheat, better for athletes and anyone looking for high energy food. Learn more at Kamut.com. While we haven’t loved every whole grain pasta we’ve tried, pasta made from Kamut/Khorasan wheat merits your attention. We’ve been serving it up and no one has noticed that it isn’t conventional pasta—whereas we did get complaints from picky eaters about whole other wheat pasta. 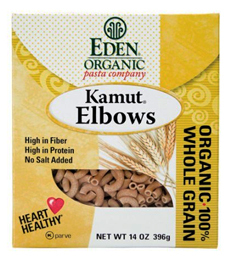 So we stocked up on lots of Kamut/Khorosan elbow macaroni, spaghetti, rigatoni and spirals from Eden Organic, and have been feeling good about eating more pasta (after all, we must have three servings of whole grain daily!). The ancient grain of the Pharaohs was einkorn (a NIBBLE Top Pick Of The Week). But at some point, Khorasan wheat was introduced into Egypt (the modern name is balady durum, or native durum), possibly by invading armies of Greeks, Romans, or the later Byzantines. Khorasan is the Pahlavi (Persian) word for “the land of sunrise.“ The ancient land of Khorasan included territories that presently are part of Afghanistan, Iran, Tajikistan, Turkmenistan and Uzbekistan. The wheat can still be found growing in small plots in Turkey, the home of Mount Ararat and Noah’s Ark. Legend says that Khorasan wheat, which is also called Camel’s Tooth or the Prophet’s Wheat, was the grain Noah brought on the ark. Kamut sells its Khorasan wheat to different manufacturers, who turn it into hot cereal, cold cereal puffs and corn flakes, pancakes and much more, from puffed corn cakes (similar to rice cakes) to baking flour.